I got the idea for Feathercraft while still in university, about 1970. Most summers I went up to Yellowknife (NWT) or Whitehorse (Yukon) and worked as a prospector for small mineral exploration companies. We were looking for gold, copper, zinc, uranium, etc. We flew in small, single engine bush planes on floats and landed on small lakes. Frank Moyle, a Northern pioneer, was my partner at the time. Usually, we set up bush camps for a few weeks and prospected the area. The idea of a small, light-weight boat that could be carried on our back seemed like a good one. He suggested an open canoe. I already liked kayaks. When I was only 7 or 8 years old, my family spent two summers staying in a cottage on a small island near Vancouver. The old lady next door had two small wood frame, canvas skin kayaks. I got to paddle them around the bay. They were very light and responsive. This is one of my best memories. When I graduated from university in 1972 with a Bachelor of Commerce, I didn’t know what I wanted to do. So I went back to the bush, prospecting. I also worked on oil rigs before taking an administrative job in Edmonton working for an oil company. I hated the job but while I was there, I obtained my commercial pilots licence. I didn’t fly air planes long though. Too noisy. Eventually, I quit everything. I decided to forget about the career and do something I wanted to do. I rented a small car garage and started designing a kayak. As for the name, I let my thoughts drift and came upon “feather”. A feather is very strong for its weight. The vane is hollow. The aluminum tubes I was considering were hollow. Remember, this was at a time when no one had made folding kayaks with aluminum tubes. The word “craft” can mean boat, or made by hand, and my kayak was both. After living with the name for a while, it seemed like a good choice. Early on in the process, I decided on 6061 T6 aluminum alloy for the frame material. This material was used in the small airplanes that I had been flying. It is very strong, light and resistant to saltwater. By 1977, I had obtained a patent. I worked occasionally to pay my rent and to eat. I moved from the car garage and squatted in an abandoned building on what would become Granville Island in Vancouver. Development of the area began around that same time, and I was discovered. I was offered a small, derelict shack in the area and became the first tenant of this now popular area. The shack was 19’3″ in length. That dictated the length of the first double kayak. To work on the opposite side of the kayak, it would have to be carried outside and turned around. The place was heated by a small wood burning pot-bellied stove. In winter, I’d scavenge building sites for wood to heat the place. Sometimes there was more time spent scavenging for wood than building kayaks. I worked at Mountain Equipment Co-op as commercial sales manager for a couple of years; did some climbing, arctic skiing and some long kayak trips. I also made greenhouses to help pay the rent. In 1979, the first K-l was completed. During my time working at MEC, I met Larry Zecchel and in 1981, he became my first business partner. The first Feathercraft K1’s were sold later that same year. To pay for materials to build more kayaks, Larry often took prospecting jobs in the bush during summer and winter. I joined him in winter. We staked claims near Dawson City in the winter at -40 degrees Celsius. Good wages. It took about four years before we could both work at Feathercraft full time. In 1985, we moved from the “little yellow shack” to our current location. By 1994, Larry Zecchel was ready to move on. He left Feathercraft to follow his own dream. He built technical snow shoes, and has continued in the outdoor industry. My next partner would be the woman I hired as office manager in 1990, Theresa McCarthy. She runs things, while I get to do what I love—tinker with new ideas and designs. The company has remained on a very solid, steady path. By staying a relatively small company, with a truly skilled team, Feathercraft has been able to respond to changes in the market and the economy. Having any type of small business is a challenge. But what makes it all seem worthwhile is knowing that our products bring true enjoyment and the wonder of nature to so many people around the world. The Feathercraft brand has become respected worldwide. We have worked hard to earn our reputation for high quality standards and innovative designs. All Feathercraft products continue to be made at our shop on Granville Island, Vancouver, Canada. And I still enjoy paddling to work most days, all year long. 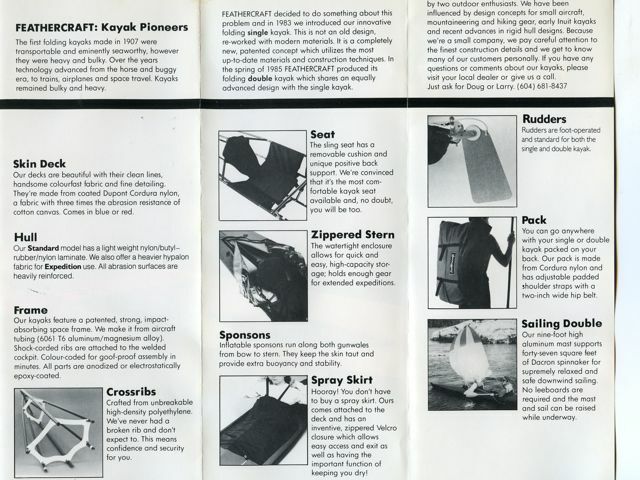 And after 40 years, Feathercraft has stopped making kayaks. Due to a number of factors, including poor economic conditions, changing lifestyles, flight baggage restrictions and increasing costs, we have found that making our premium kayaks is no longer financially viable. We will miss the incredible feedback and adventure stories that we have received over the years.